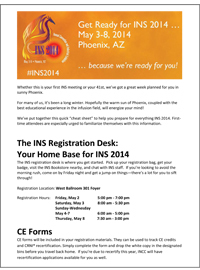 INS would like to thank the infusion nurses and industry partners for joining us in Phoenix for INS 2014! We sincerely hope that the education, networking and business development opportunities exceeded your expectations, and that you'll share your increased knowledge with your colleagues to improve patient outcomes in your practice. We would also like to thank all of our industry sponsors and exhibitors, without whose support this event would not be possible. This event was a true celebration of the infusion specialty, and we're so glad you were able to be a part of it! We look forward to seeing you in Louisville next spring for INS 2015!